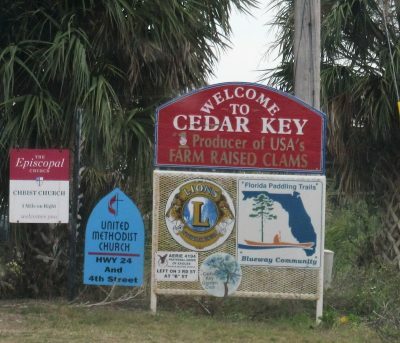 Cedar Key…..Cedar Key! I don’t know how many times I have watched vlogs or read blogs singing the praises of Cedar Key, Florida. With these accolades rattling in my brain, I had high expectations when Jim, Chewie, and I took the almost two-hour drive to visit Cedar Key. Did this place live up to the hype? Is Cedar Key for me? 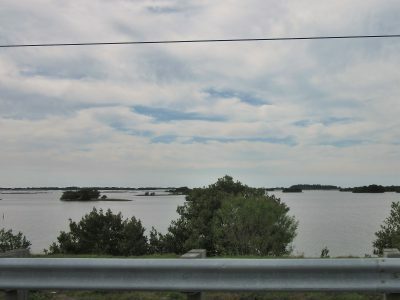 In order to reach Cedar Key, Florida, which is a small Gulf Coast town, one must drive through a portion of Cedar Key Scrub State Reserve, and the Cedar Key Museum State Park is also located in the area (not open daily). We enjoyed the view as we crossed bridges over the channels as we made our way to the seaside town. 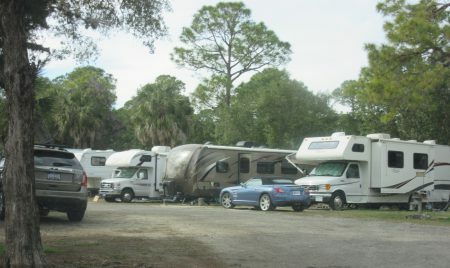 Passing the RV park, Sunset Isle, I was really surprised, but not in a good way. It was not what had been built up in my mind that it would be. It looked small, cramped, and did not have as much water access and water views as expected. Sometimes the image one develops in one’s head is not the same as the optics upon arrival. There is little space between these sites. Driving into the little town, we found a very spacious parking area near the water, and it did not take us long to find beach access. Though a small beach area, it was nice. Chewie loved getting to walk on the beach. He even put a few toes in the water. Unfortunately, there were folks there with some dogs that were somewhat aggressive, and the men walking those dogs seemed to be oblivious to that fact. No matter how we tried to avoid these men and the dogs, they seemed determined to go the same way we would go. Finally, the three of us gave up on enjoying any more beach time. 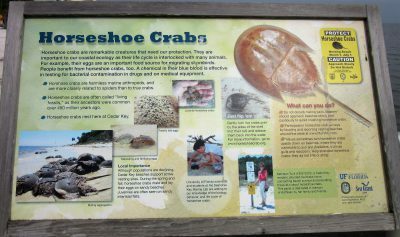 One really cool thing we learned about the Cedar Key beach is that it is a nesting beach for the horseshoe crab, and from March 1 – July 1, they are very careful to protect these crabs and their babies. We walked along the water’s edge, enjoying the local sea birds. Many birds were happy to pose for pictures. As we made our way around, we slowly entered the area of shops and eateries located along the water. If ice cream, or even better – gelato, can be found, Jimmy Johnson will find it. He enjoyed a cold, sweet treat while I held Chewie and watched the locals and winter visitors move around and interact. Then, we swapped, and I got my own sweet treat, which I enjoyed as we made our way back to the car. There were a couple of cute things that we found as we toured the town; you can see these below. To answer my questions above. 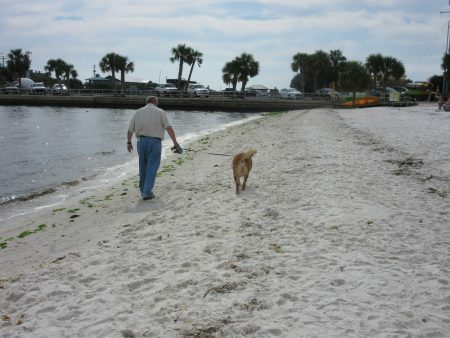 Neither Jim nor I thought Cedar Key lived up to the hype – a word he and I both used. It is a nice little town, but could I spend a winter, or even a month, in the small RV park and town? Probably not. It is a nice place to visit but one in which I would not care to stay for very long.